Can Finn's Attack Aura affect a figure you control that has a range >1 if that figure is attacking an adjacent figure? only my own unique Army Card? Do you have to place Finn on a Unique Army Card once he is destroyed, or is Warrior’s Attack Spirit 1 an optional ability? Can I place Finn's "Warrior's Attack Spirit 1" on the Airborne Elite Army Card even though the Airborne Elite have not yet Dropped? * ATTACK AURA 1 benefits all friendly units adjacent to Finn the Viking Champion with a range of 1. * WARRIOR’S ATTACK SPIRIT 1 may benefit any unique army card still in play. As a Human who follows Jandar, Finn The Viking Champion may aid Sir Orrick with his A BROTHER'S CALL movement bonus. As a Human who follows Jandar, Finn The Viking Champion may benefit from Capt. John Varan's PURPLE HEART wound reassignment. As a Unique Human, a destroyed Ebon Armor you control may be placed on Finn The Viking Champion's Army Card to replace Finn The Viking Champion upon his own destruction. Remember that despite the fact that Finn's Attack Aura 1 Special Power can only be use to boost adjacent friendly figures with a range of 1, once dead, the spirit of Finn (Warrior's Attack Spirit 1) CAN boost unique ranged figures or squads. As an example, Krav Maga agents adjacents to Finn would not get the bonus even if attaking adjacent ennemy figures. But, once Finn is dead, his spirit can give the Krav Maga agents (a unique squad) a +1 attack. Hey newbies, remember that Finn only boosts melee troops while he's alive! Remember that! Remember! Don't forget! I can't add enough exclamatory sentences here!!!!!! He's only capable of helping a ranged unit when he's dead! Because of wrong translation on the army card into dutch I have been playing wrong with Finn for a month. In dutch it clearly states that he has an warrior defense spirit instead of warrior attack spirit. I can tell you, you play a whole different game then. Thanks to the helpfull unit index at this forum I saw there were more wrong translations, so thanks for that. In the dawn of battle"
I like Finn; I'm surprised he's only got a handful of posts. He's my number one choice with the Knights of Weston (Although I don't have Alastair or Gilbert). Sometimes I stick him or Eldgrim on an important Glyph. I've contemplated doing the same with Krug. What exactly does this clarification mean? Yes, you can place it on any unique army card, yours or your opponents, on the battlefield, or not. This includes the Airborne Elite before they drop as well as the Retchets. HOWEVER. You do not get to use any of the special powers on that Army Card if the order marker is turned over and they are not on the board. How does Finn's power have anything to do with the army card's special powers or order markers? I don't see what the big HOWEVER is getting at. I think it's trying to say that even though you can put Finn on the AE or the Rechets when they aren't in play, you still can't use them... Seems pretty obvious that you can't do that though. Last edited by Orwald; March 24th, 2009 at 03:39 PM. Finn is a well balanced hero. He makes an impact alive, and dead. Finn can tangle with the best of them. He belongs in tournaments, but is never there. What I don't understand is why Thorgrim, almost a mirror of Finn, is ranked so low. He could make Q9 or DW9000 even more devestating forces. Finn is a well balanced hero. He makes an impact alive, and dead. Finn can tangle with the best of them. He belongs in tournaments, but is never there. Finn appears rarely at events for a few reasons. Sir Gilbert does the same things in life, plus he helps the knights movement, which is a geat benefit. 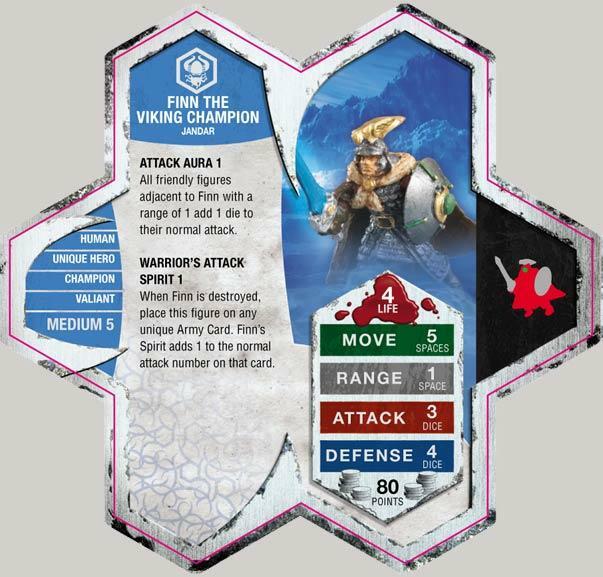 As for the attack spirit, most of the multiple attackers in the game rely on special attacks, so only a few options (KMA being the most obvious one) can really make Finn's spirit a game-changer. What I don't understand is why Thorgrim, almost a mirror of Finn, is ranked so low. He could make Q9 or DW9000 even more devestating forces. I actually agree that Thorgrim seems about as good as Finn, particularly given that Gilbert renders the "better with the knights" argument less relevant. But Q9 and (especially) DW9k are not great places to put Thorgrim's spirit. High defense, low life figures actually get relatively little marginal benefit out of one additional defense die. Contrast that with, say, Braxas, whose 8 life points will last a lot longer by jumping from 3 defense to 4. Contrast that with, say, Braxas, whose 8 life points will last a lot longer by jumping from 3 defense to 4. Neither are terrible options, but not near the top of my list. The Izumis, with only 3 life, can be brought down pretty quickly and don't give you much bang for your buck for Thorgrim's spirit. Charos certainly doesn't have that problem, but with only 1 attack per OM, I wouldn't build a strategy around feeding Thorgrim's spirit to Charos unless I was playing against a nearly all-melee army. I break down my preferred Thorgrim options in the USR thread, here.